Previously, I used the "USBbootBuilder-16_Kernel4.3.0-SeaFlashLin-046.USBsetup.exe" to create a TinyCore Linux USB bootable flash drive. Using UEFI boot option, the USB flash drive boots to a /home/tc directory. Look for a directory with full write access under /mnt. At my computer, it is sdd1 directory which is the root of the USB flash drive. Encountered seaflashlin was not found error ? Using "./seaflashlin_048_32 -i" or "./seaflashlin_048_64 -i" produce no result ? Please check your hardisk and write down the model number and serial number as you will need it later. Using SeaChest method to update the Seagate 8TB hardisk firmware from DN02 to DN03 in order to solve the beeping, buzzing or humming noise during idling. If your current Seagate Desktop 3.5 SATA hardisk firmware does not begin with the digits "DN02”, then you have a configuration which is not compatible with DN03. 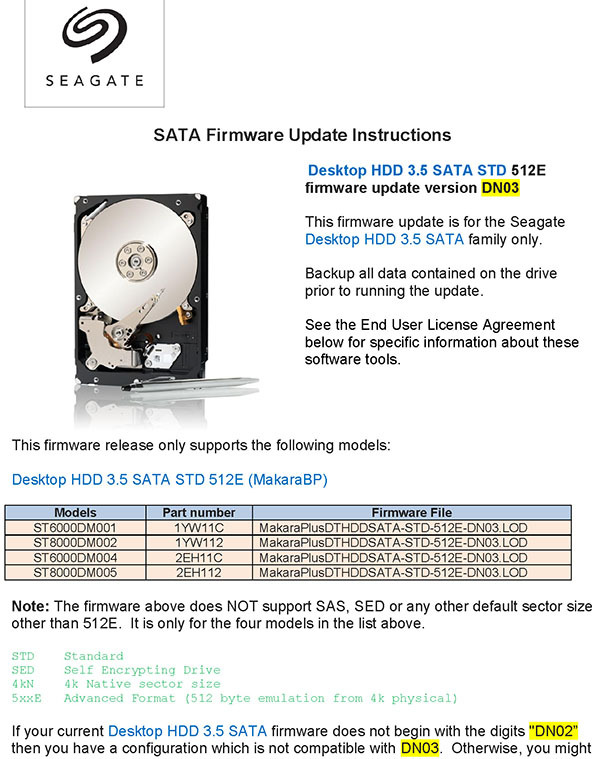 Please contact discsupport@seagate.com for support and do not continue further. Possible loss of data if this firmware is downloaded to unsupported models ! 1) Please backup your data at the hardrive first before continuing. 2) In the downloaded firmware package, there is a Firmware folder. The .LOD file is the firmware file. Please copy the MakaraPlusDTHDDSATA-STD-512E-DN03.LOD with a shorter name DN03.LOD. The DN03.LOD must be in the same directory as the SeaChest_Firmware_222_11110_32.exe or SeaChest_Firmware_222_11110_64.exe files. 4) Right-click a command prompt and left-click "Run as administrator". If your Windows Operating System (OS) is 32-bit, please use SeaChest_Firmware_222_11110_32.exe. If your Windows Operating System (OS) is 64-bit, please use SeaChest_Firmware_222_11110_64.exe. 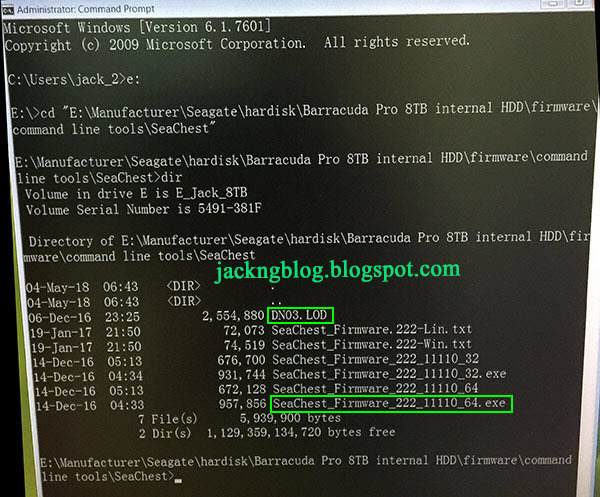 The Seagate 8 TB hardisk that I want to update is ST8000DM005-2EH112 under PD1 Handle. You must select the correct hardisk by checking the Model Number (STxxxx) and Serial Number of your hardisk. You will see a lot of "points" appear all the time. There can be no power outage at this time. Please do not perform any other operation on the computer and do not interfere with it. Finally, "Firmware Download Successful" will appear. The beeping, buzzing or humming noise of the hardisk immediately gone away. I just want to say thank you for this excellent and thorough guide. 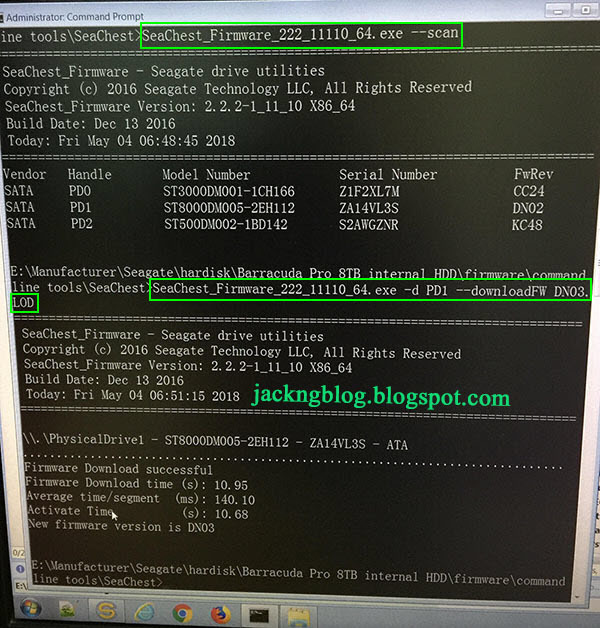 I looked at every resource from Seagate's website and NONE of them provided the actual working way to update the firmware (at least that I could understand). Without your guide, I would still be lost. Your guide was clear, linear and easy to follow - and best of all - it worked! Thank you so much for taking the time to do this - it was a lifesaver.